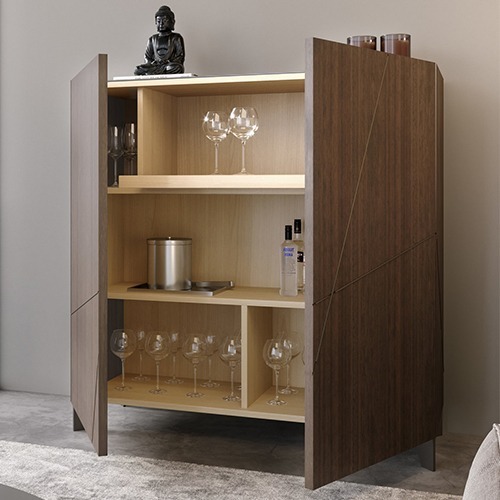 Bar with MDF structure covered in smoked eucalypt leaf, special glamor interior presentation with natural veneer, with 2 doors and 3 interior shelves (1 sliding shelf). Acrylic varnish finish. Metal details in oxidized brass on the front and sides. Foot with epoxy paint. Wood veneered, lacquered glass or Luxury ceramic top. Collection includes dining table, dining chair, console table, cabinet, bar cabinet, and mirror. Inquire for customizations.